Southern defenders Alex Vanmeter (50), Auston Colburn (77) and Austin Baker (21) combine to bring down Trimble running back Conner Wright during a first half run Friday night in a Week 9 TVC Hocking football contest at Roger Lee Adams Memorial Field in Racine, Ohio. RACINE, Ohio — Not exactly the home finale the Tornadoes were hoping for. The Southern football team produced eight punts, ended a possession before halftime and also threw an interception during its 10 offensive drives while mustering only 34 yards of total offense on Friday following a 51-0 Senior Night setback to visiting Trimble in a Tri-Valley Conference Hocking Division contest at Roger Lee Adams Memorial Field. 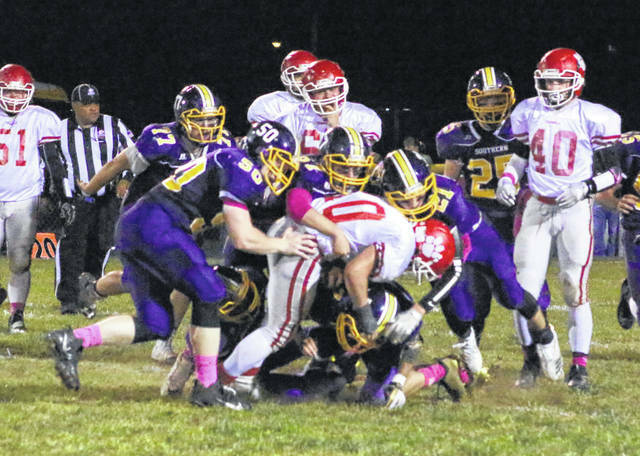 The host Tornadoes (6-3, 4-3 TVC Hocking) had very few answers for the Tomcats (8-1, 7-0), who clinched a share of the TVC Hocking championship during the one-sided affair. The Purple and Gold yielded only 17 yards of offense in each half, as well as going through all of the second and third quarters without a single first down. The hosts also finished the night with 30 rushing yards, four passing yards and four first downs total. The Red and White, conversely, practically ran the ball at will as the guests churned out 238 rushing yards on 30 carries in the first half while building a 25-0 intermission advantage. Conner Wright scored on runs of seven, 16 and eight yards over the opening quarter and a half of play, allowing the Tomcats to secure an 18-0 advantage with 5:20 remaining in the half. Cameron Kittle added a three-yard run with 46 seconds left before halftime, giving Trimble a 25-point cushion at the break. Kittle tacked on a five-yard run with 9:49 remaining in the third canto, which started the running clock with a 31-0 lead. The guests went on to add a three-yard Wright run with 3:46 left, then received a 50-yard punt return for a score by Max Hooper with 35 seconds remaining in the third — making it a 44-point contest. THS produced its final score of the night on a Todd Wisor 14-yard pass from Tabor Lackey at the 7:59 mark of the finale. Blake Guffey successfully booted the extra-point to wrap up the 51-point triumph. 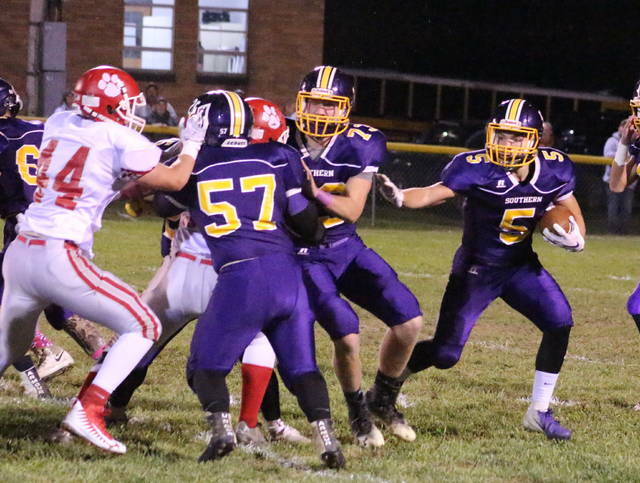 Wright gave the Tomcats a 6-0 first quarter lead with a seven-yard scamper at the 7:59 mark, then THS followed a Kittle interception by marching 78 yards in 12 plays — with Wright scoring from 16 yards out for a 12-0 edge 54 seconds into the second period. The Tornadoes managed their longest drive of the night midway through the opening stanza as the hosts covered 33 yards in seven plays before Kittle picked off a Logan Drummer pass at the THS 22 with 4:41 left. Southern — which managed only two first downs apiece in the first and fourth quarters — had only one other drive result in more than three offensive plays from scrimmage. The Tomcats, on the other hand, did not have a single punt in the contest and went scoreless on only one of their first eight drives as Noah Rossiter missed a 37-yard field goal with 7:09 left in the second quarter. Following the game, first-year SHS coach Cassady Willford acknowledged that he wasn’t as much disappointed in his troops as he was just thoroughly impressed by his counterparts on this night. He did, however, mention that the Tornadoes still have one game left to get the ship righted — and that one game happens to be against archrival Eastern next Saturday night. “I have to give credit to coach Phil Faires and the Trimble Tomcats. That is a great football team, and I don’t throw great around a lot, but that is a great football team,” Willford said. “Now, our kids realize that we are fortunate enough to play in what we consider the biggest rivalry in Ohio — and that’s playing Eastern at Eastern next week. Trimble claimed a 22-4 advantage in first downs and outgained the hosts by a sizable 410-34 overall margin in total yardage. The guests were also flagged twice for 20 yards, while SHS drew one penalty for five yards. 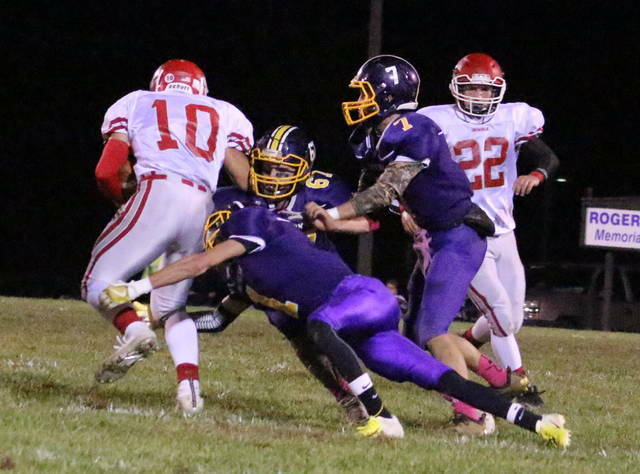 Drummer led the Tornadoes with 16 rushing yards on nine carries, while Trey McNickle added 15 yards on 15 attempts. Brody Dutton also had one tote for negative one yard. Drummer completed 2-of-11 passes for four yards, including one interception. McNickle and Reece Reuter each hauled in one pass for two yards apiece. Wright led Trimble with 130 rushing yards on 18 carries, followed by Hooper with 106 yards on 11 tries. Kittle also chipped in 82 yards on nine rushes. Kittle went 1-of-3 passing for 15 yards. Lackey was also 4-for-4 passing for 67 yards and a score. Five different receivers hauled in one pass, with Jack Nagucki leading THS with 34 yards. Southern — which is still mathematically alive in the Division VII, Region 27 playoffs — completes its regular season on Saturday night at East Shade River Stadium. Kickoff is slated for 7 p.m.